Endive is an annual or biennial salad vegetable forming a flattened rosette of leaves 20-40 cm in diameter. There are two types, curled and broad leafed. The outer leaves are normally dark or light green, merging to the inner, more tender creamy yellow leaves. Endive is blanched to avoid the bitter taste of the darker leaves. Endive is a cool season crop, growing best at 10-20oC, withstanding light frosts and performing much better than lettuces early in the season. Under cover in cool climates, endive can provide year-round salad greens. Bitterness increases with higher temperatures. There is some risk of bolting when low temperatures persist. 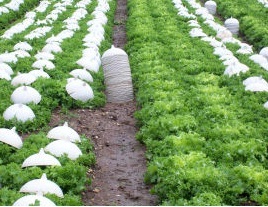 Soil requirements are the same as for lettuces. Summer crops should be grown in light shade. Sow in spring for summer crop or in summer for a crop in autumn either in trays or directly in drills. Thin or transplant seedlings to 30cm apart according to the size of the cultivar. To blanch leaves, choose nearly mature plants with dry leaves. Cover with a bucket for complete blanching, or for partial blanching, cover the centre with a large plate or cardboard disc. Blanch a small number at a time otherwise they will deteriorate. Maintain regular watering and liquid fertilising otherwise leaves will grow more bitter if growth slows. 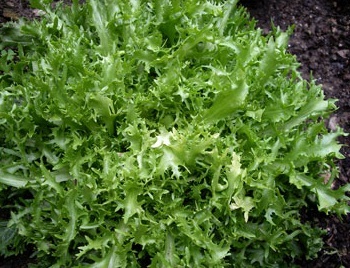 Cut endive between seven and ten weeks after sowing depending on the season. Sow as a seedling crop in spring, harvesting the leaves. Eat when fresh as endive does not keep.